If you’re like me and love nail art but you haven’t mastered stamping or free hand art, I found the perfect solution: nail art stickers! Adding nail art stickers to your nails is an instant way to dress up your digits without any extra effort and they’re also very inexpensive when compared to stamping image plates. 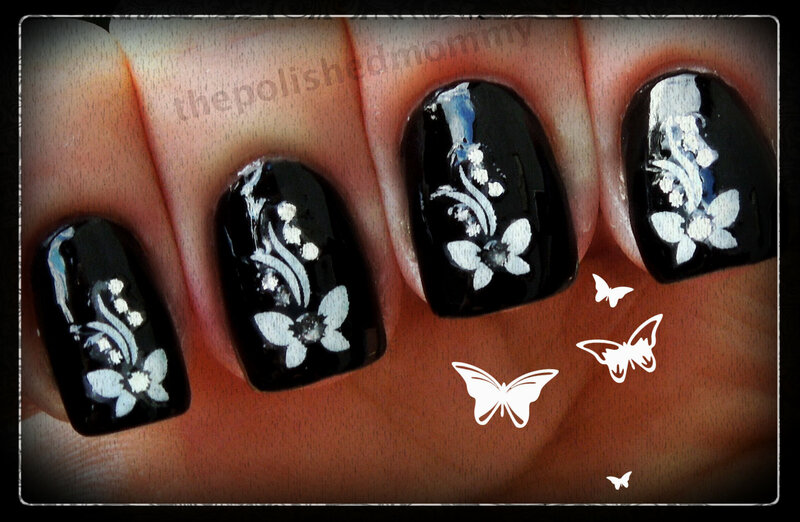 I recently received these butterfly nail art decals, part of the white jewelry collection, from Jobynailart. JOBYnailart is committed to providing the best experience possible for both nail professionals and consumers, by offering quality products, creative and original designs and excellent service. The pack comes with 18 white butterfly decals, each contains 6 “jewels”. Paint your base color on and let it dry. Gently peel off one of the decals using fine tip tweezers and position it on the nail. Apply gently pressure over the decal making sure it is completely adhered to the nail. You could do a simple accent nail. Or you can add them to all of your nails. Price: $2.99 with free shipping on all domestic orders. (Free shipping for all qualifying international orders).